How do you describe Loloi Rugs? Premium collaborations and exceptional quality at a reasonable price. 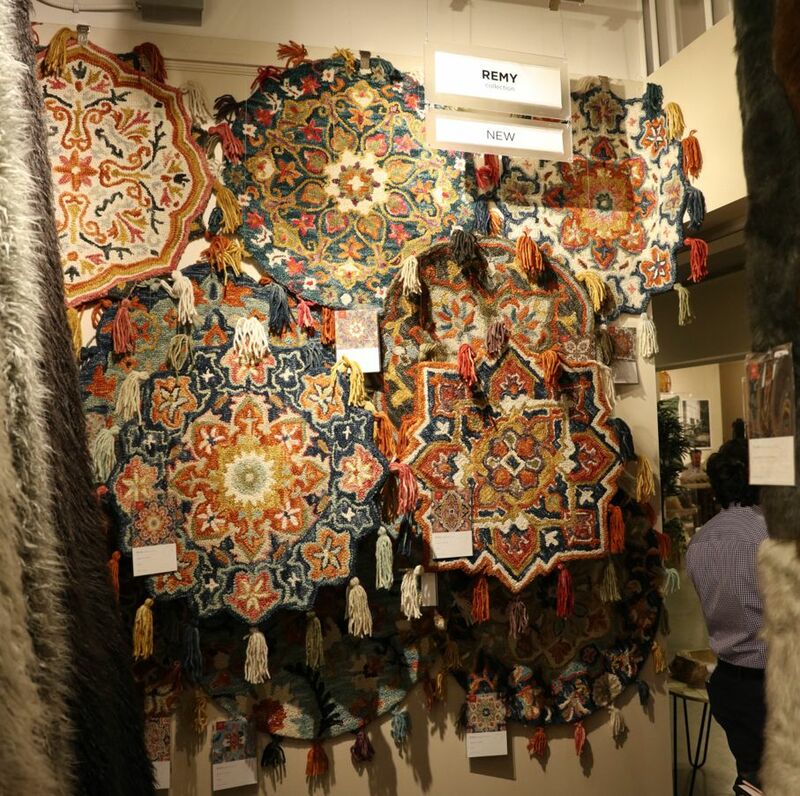 We first heard of Loloi Rugs at the 2017 Summer Las Vegas Market, a biannual expo that brings together companies manufacturing and/or distributing furniture, home decor, and accessories in the United States. But from the moment we began browsing Loloi’s booth, we knew they brought something very special to the table. Thankfully, we were given the opportunity to sit down and talk with Austin Craley, VP of Sales. He walked us through their entrancing exhibit and gave us the low-down on all the latest and greatest trends Loloi brings to Market and retailers across the country. 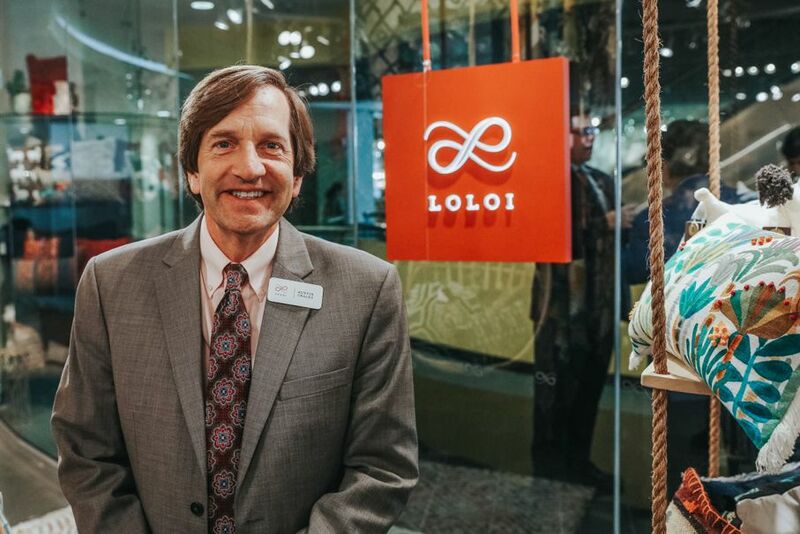 Here’s the inside scoop on Loloi Rugs from our exclusive interview with Austin Craley. Surprisingly, even though their offerings are for the “Average Joe,” you’ll be hard-pressed to find similar quality and craftsmanship from competing companies. In fact, Loloi takes craftsmanship very seriously. 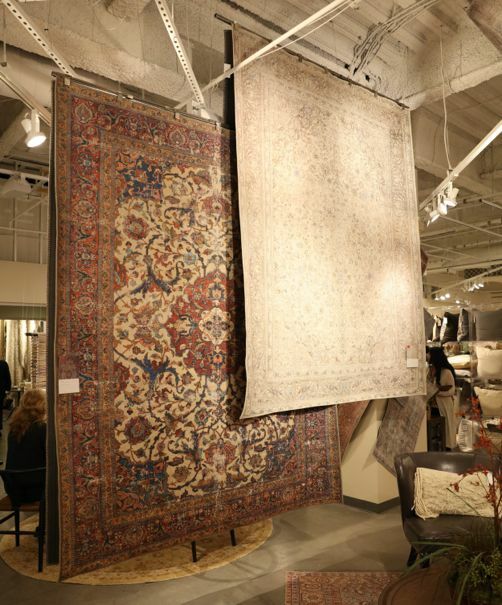 Their eye for detail has made them a staple in the rug industry—and as a result, they’ve earned more awards than any other rug company in the last decade. 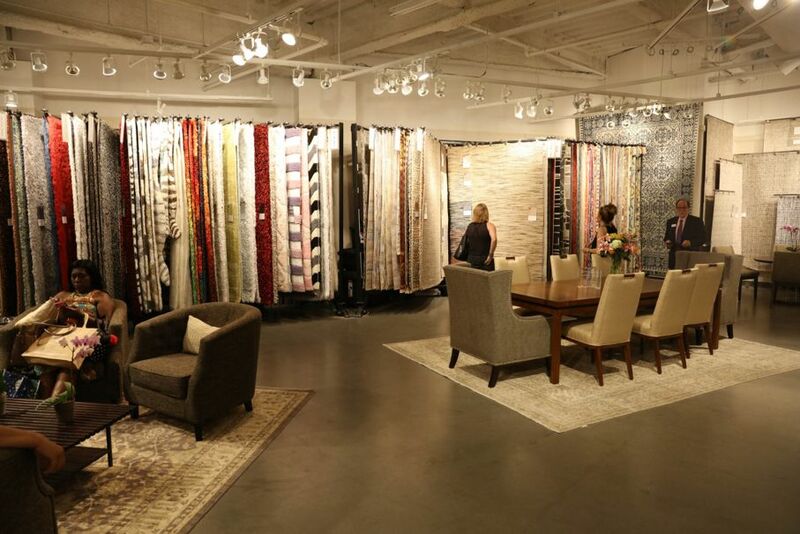 From the high-end, hand-knotted rugs to hooked designs, the quality you find in Loloi rugs is impressive, to say the least. 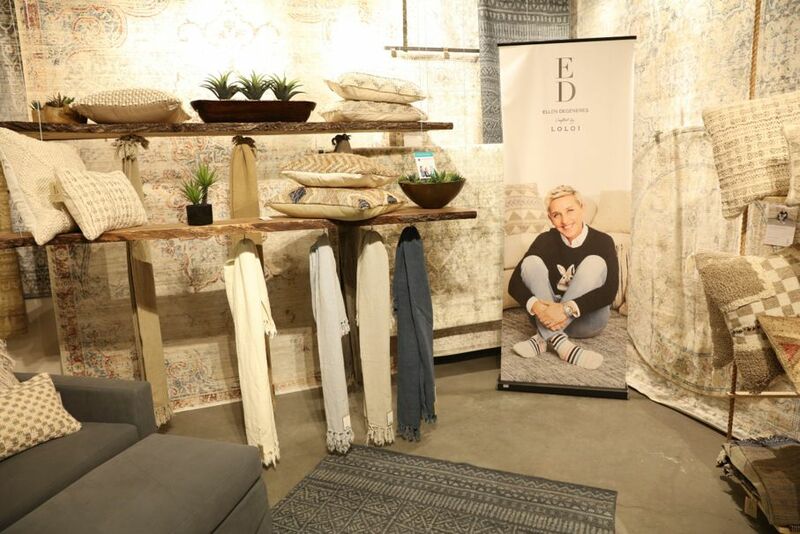 In recent years, Loloi has broadened their product line to include rug complements, including pillows and throws. We were first drawn to the pillows Loloi displayed at the Las Vegas Market because they’re so luxurious. Pillows like this Plum/Silver one made of rayon silk and this eccentric taupe and gold cotton one are the perfect addition to any living room or sitting area. And on cold winter nights (the one’s we’re all dreaming about right now in the dead of summer), is there anything better than a comfortable throw blanket? Absolutely not! That’s why we love their comfy acrylic Duke collection. One of the most exciting aspects of the company, aside from their rock star product offerings and amazing quality, is their collaborations. Loloi works with several world-famous celebrities and designers to put their creative designs on the map. HGTV’s Joanna Gaines of Fixer Upper is one of the most notable television figures for consumer and industry professionals. She’s made us all obsess over shiplap and gray walls. And now we have one more obsession, her collection through Loloi. 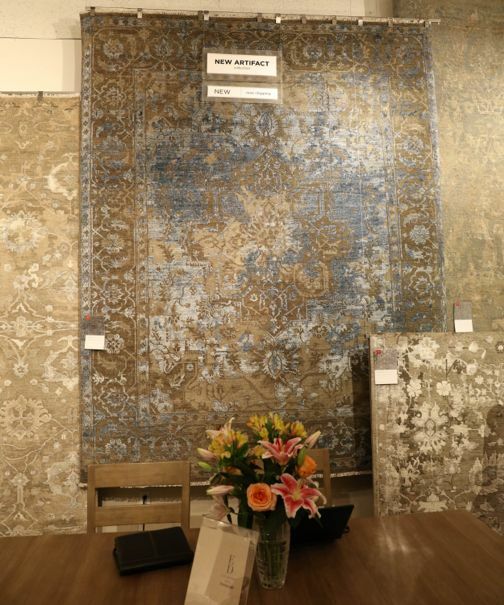 It’s no surprise that the entire line is 100% Joanna, from her Santa Fe Spice rug (a personal favorite) that’s hand-hooked in India, to the June Collection, if you’re a fan of Joanna’s style, this collection is a must-see. Ellen’s line is everything you’d hope it would be and more. Although it was just put on the market back in January of 2017, Austin tells us they face a constant effort to keep up with the demand. You’ll notice that the line has a heavy focus on solid and more traditional patterns, such as this blue rug from the Trousdale Collection. This ivory and red power loomed rug is also one of our favorites. In addition to these big collaborations, Loloi also partners to create these lines: Ernest Hemingway Lifestyles and Justina Blakeney. It was a pleasure speaking with Austin at Market to learn more about Loloi’s products and partnerships and to browse their tremendous booth. Just being able to run our hands over the rugs, it was evident that they’re doing something very right at this company. Be on the lookout for Loloi rugs at major retailers in the home decor and furniture world in the coming months! 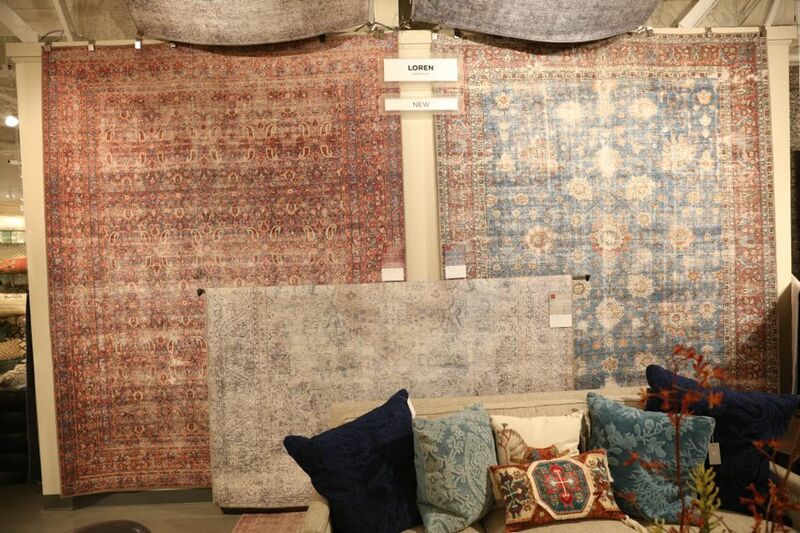 To check out more of their selection of rugs, pillows, and throws, view the Loloi Rugs online catalog here.